Growing up as a child in California, I have had a lot of fond memories of my mother and her famous pineapple fruit salad. Well, my family did run a fruit bar at the time, and what I caught onto very fast was that cutting fruits, especially pineapple and watermelon was one of the most difficult tasks to accomplish. As each fruit is cut differently and in a different way, it was necessary to have the proper set of knives. And this was one fact I learned firsthand when I worked at the bar before pursuing my career in interior design. But a lot of my mother’s passion for knives and delicately cut fruit remained with me, and I grew up into what you may call a knife enthusiast. May it be cutting fruit, dicing meat and sushi, a well-built knife is integral to any kitchen structure. Today I would like to talk about one of my favorite knife makers the steel industry has to offer. The tradition of crafting the highest quality blades has been in the heart of the Japanese culture for hundreds of years. From the Muromachi era to the Meiji period, Japan has built a legacy on blade making excellence that still remains unparalleled throughout the world. The Kamikoto builds on this very legacy. Each of their knives is a masterpiece in the field of blade crafting, and by modernizing the older forms, they make the traditional style of knife making relevant even today. Yamamoto-san, who is the current and the 4th chairman of the Kamikoto advisory board, continues the work that his great-great-grandfather had started in 1908. The company initially began as katana forgers that refined steel and made katanas for the Japanese Navy. But post WW2, they soon grew to be one of the leading brands in the knife making industry that carefully selected and sourced their steel from all over Japan such as Honshu, Niigata, Ibaraki, and Kanagawa. 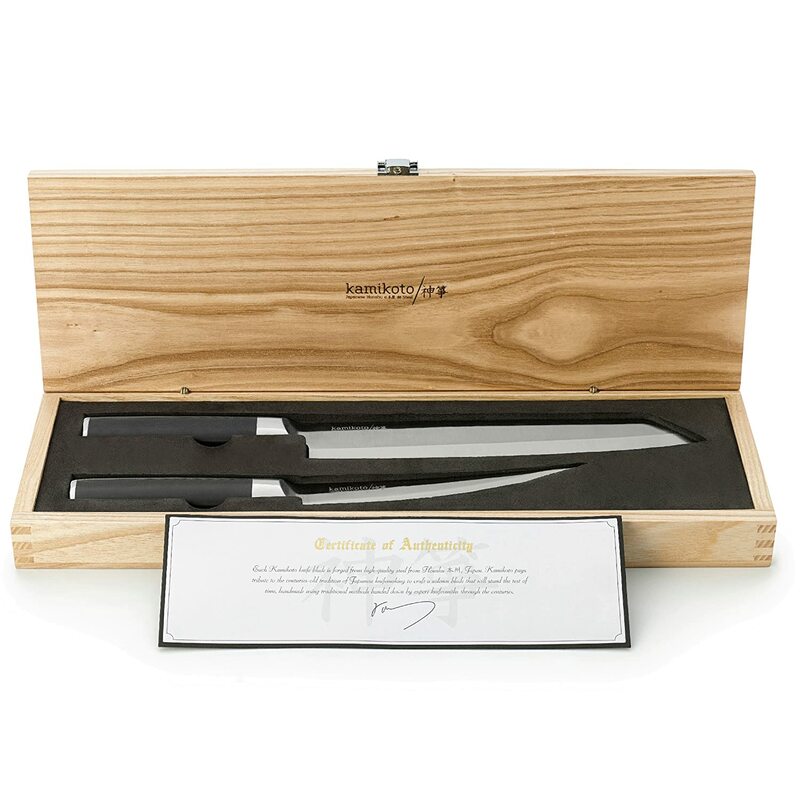 Their knives are made from the highest quality, and their unsurpassed durability lasts them a lifetime. 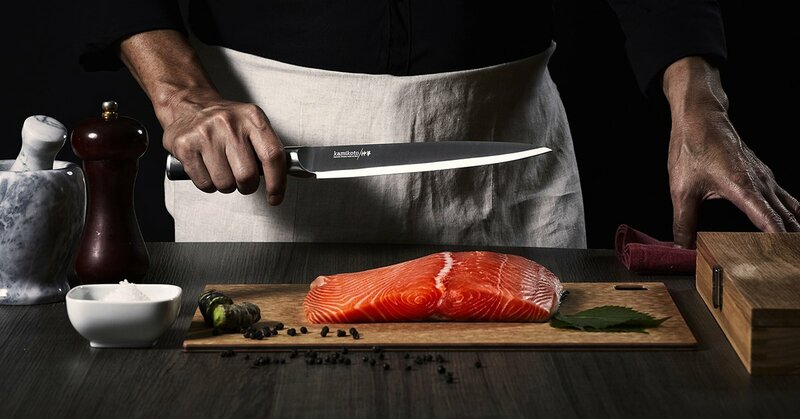 With the perfect blend of cutting prowess and aesthetic beauty, Kamikoto knives have been a go-to for a lot of professional chefs and amateur home cooks alike. The philosophy of “omotenashi” or selfless hospitality is central to Japanese culture. Understanding the needs that a customer can have and anticipating the perfect product for them, is an essential aspect of their manufacturing dynamic. And for a very long time, Kamikoto have specialized themselves promptly and accurately catering to client issues and demands. 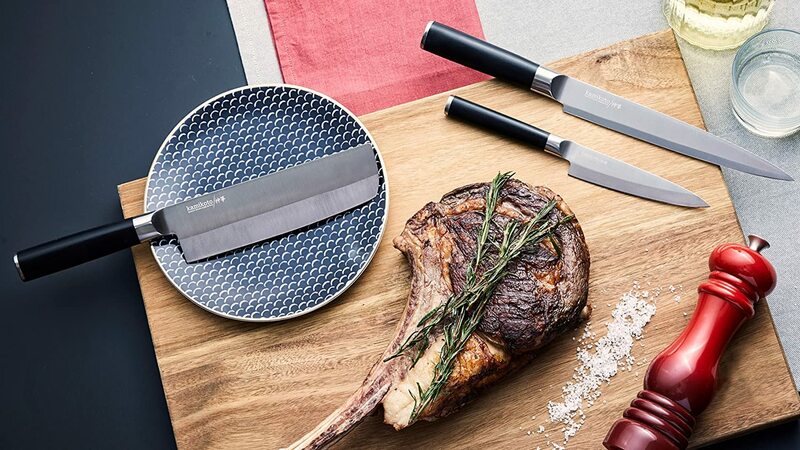 No single knife can be versatile enough to provide to a wide range of uses, and the Kamikoto line-up has an extensive range of blades, which collectively cover a vast user base. Crafting a high-quality knife is a rather complex task, hence Kamikoto doesn’t just utilize a single craftsman for the job. Unlike a lot of their competitors, they rely on a group of dedicated artisans to make a single knife. Crafting one knife involves a smith who forges out the initial raw shape, then a polisher who carves in the more delicate lines, and finally a blade specialist who sharpens the knife to support a “traditional fine edge”. Apart from the amazingly well-polished build, each Kamikoto knife comes enclosed in an aesthetically pleasing natural-ash wood box along with certificates of authentication. An integral part of the Kamikoto culture is to take pride in the quality of materials that are invested in the making of each knife. And each knife is made out of the best quality of steel that Japan has to offer. From Honshu to the prefectures of Niigata, Japanese steel manufacturers have proven to demonstrate an unparalleled commitment to the making of the highest quality of steel. So, when one buys a Kamikoto knife, they know that they are getting the best in both craftsmanship and quality. My wife is an avid fan of Korean food, which more often than not needs a lot of thin-cutting and chopping the meat and vegetables. And even though she is by no means a professional chef, she completely adores her Kanpeki knife set as it not only makes cooking a lot more fun and easy for her, but she is able to do more with these knives as well. 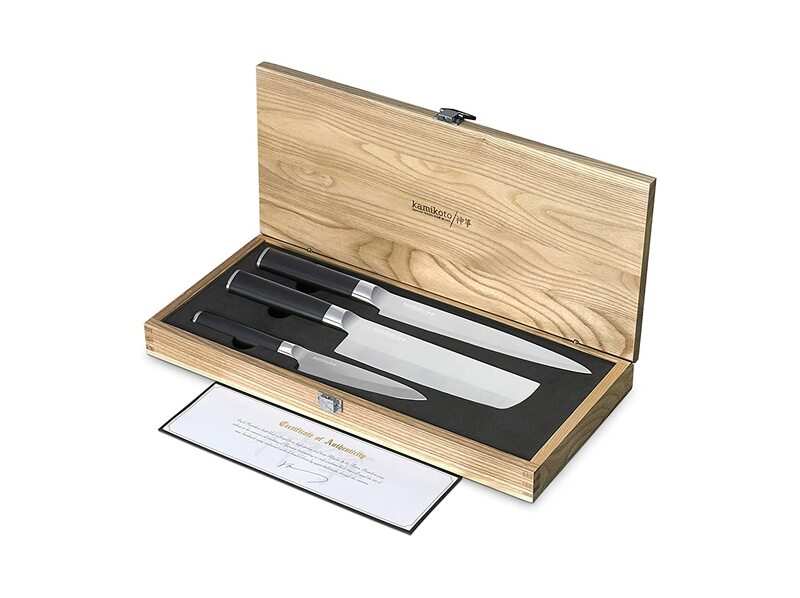 The Kanpeki knives like all the other Kamikoto sets come in an ash wood box, and include one vegetable knife, one slicing knife, and a smaller utility knife. While the Nakiri vegetable knife is 7 inches long, the slicing one is 8.5 inches, and the utility knife is 5 inches. Unlike the regular knives which are dual bladed, the Kanpeki set are single blade knives with only its right side sharpened. Single sided blades allow for better control over each cut, and with the Kanpeki knives, any chef will effortlessly be able to cut vegetables more thinly or even make their own sashimi at home. Additionally, the precision balance and the advanced grip allows the knives to sit perfectly in her hands enabling her to perform more sophisticated cuts. In my eyes, my mother will always be the best chef in the whole world. From her intricately made fruit salads to lip-smacking tenderloin roasts, she had been my culinary hero since my childhood days. Hence, I sought out the Santoku chef knife for her 62nd birthday; needless to say, she absolutely loved it and took to it immediately. And as quite a knife encyclopedia herself, mom filled me in on a bit of a trivia about the Kamikoto Santoku knife. 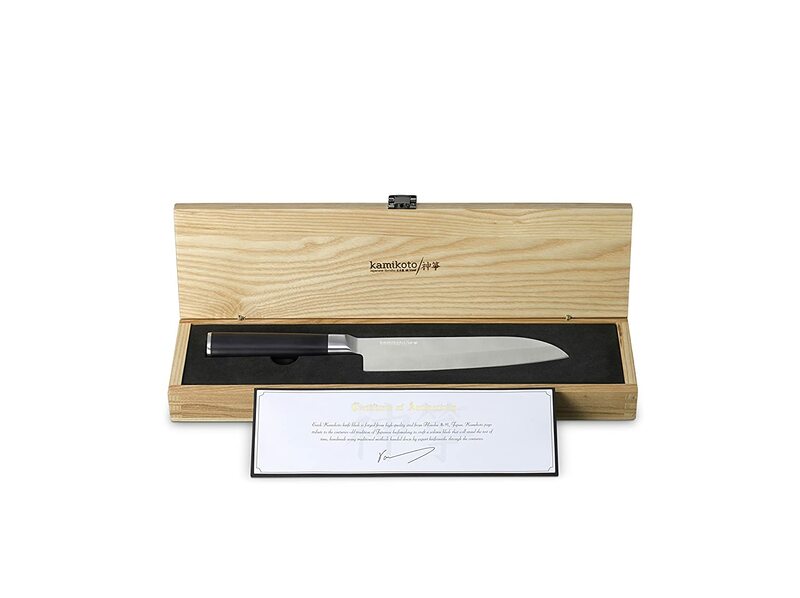 Santoku is perhaps the most traditional of all the knives of the Kamikoto line-up. Almost over a thousand years of evolving craftsmanship and design has led to the emergence of the final form, which is the Kamikoto Santoku. With 7 inches in length, the Santoku has a tapering ground on one side, and a hollow one on the other. This significantly increases precision providing more control with each cut. For increased safety, the Santoku handle comes with a secure non-slip surface. Apart from the improved grip, the handle’s unique design is perfectly sized to keep your hand away from the cutting surface. The satin finish of the blade and the handle also provide a very aesthetic appeal. 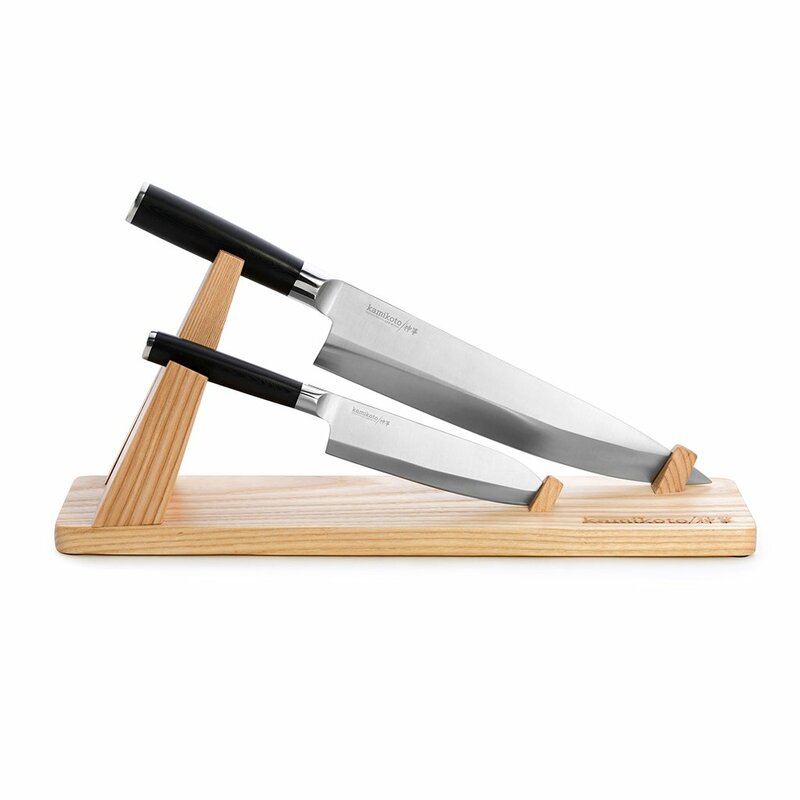 Apart from being able to cut your fruits and vegetable with flawless strokes, the Senshi Dual Knife set is a lot about granting your kitchen that much needed aesthetic appeal as well. And I should know, for it honestly appeals to the interior decorator inside me. This Kamikoto set consists of 2 knives, where one is 10 inches in length and the other 5.5 inches. With the 10 inches knife, cutting a watermelon was never simpler; it slices through the fruit with ease and allows you to make perfect dices and intricate patterns effortlessly. The 5.5 inches knife is utility based and used more for chopping out smaller celery than carving out larger fruits. Both these knives are light, easy to carry and come with a support grip that doesn’t allow the hand to slide, or the knife to slip out. But the most unique takeaway about this knife set is probably the wooden display stand. A very traditionally designed structure, the stand grants the knife set the majority of its aesthetic beauty. Its simplicity and functional beauty can make the centerpiece to any kitchen decor. The Kamikoto Kansei is rather unique in the fact that its design and build are particularly based on the Honshu knife crafting tradition. Heck! Even the high-quality steel is secured and sourced from the prefectures of Honshu itself. This set comes with a 6.5 inches Boning knife and a 9.5 inches Kiritsuke knife. As Honshu is located right near the sea, it has been home to a lot of seaside shacks and fisheries, and fish was without a doubt their staple diet. 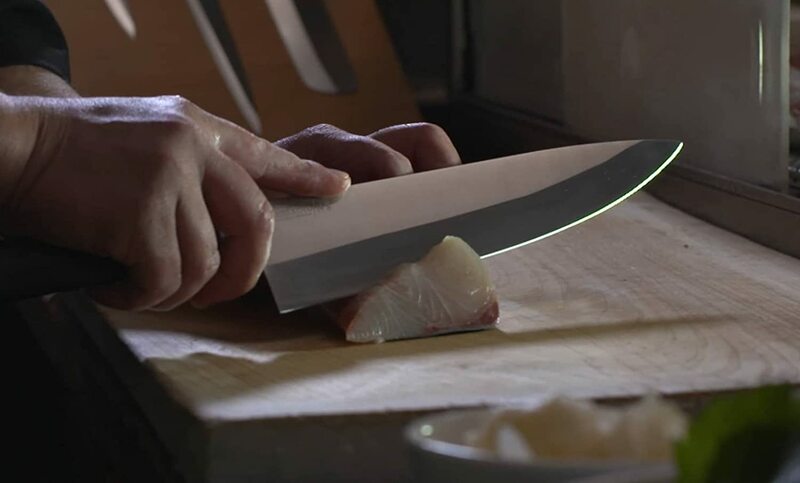 The bevel Kiritsuke knife, in this respect, is wholly steeped in the Honshu culture, as its shape, size, and design make it absolutely ideal for slicing fish. It’s weighted and balanced for optimal handling during the slicing process, and although light it is incredibly sharp and robust with a comfort grip. The Boning knife, on the other hand, is specially made for filleting meat may it be fish or poultry. It has a reverse tanto tip that allows the knife to be substantially thin and agile, thereby enabling seamless piercing and precise strokes. 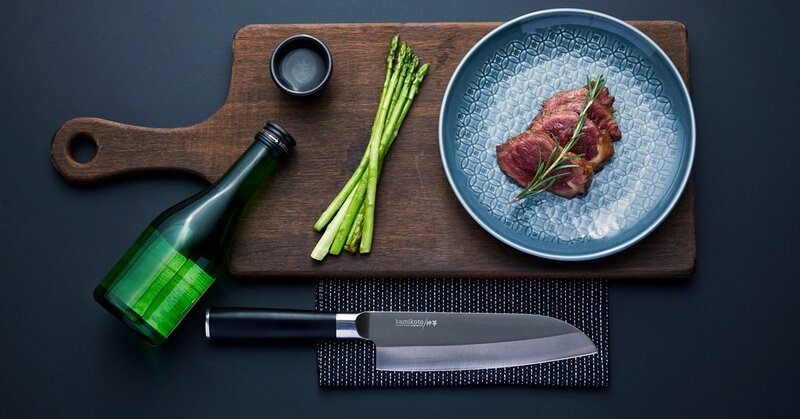 Steeped in tradition and cultural ethos, the Kamikoto range of knives and knife sets is one of the leading kitchen tool brands that cater to both professionals and amateurs alike. With an unparalleled build and diverse functionality, it can indeed become your favorite knife brand like it has become mine. Hope you enjoyed my Kamikoto Knives review today.